But not every character needs to change their personal point-of-view. But not every character should necessarily change. This runs contrary to the prevailing wisdom in modern storytelling. From screenwriting gurus to studio executives, a successful screenplay is thought to be one in which the principal characters in a story undergo significant change. But is that really true? Must every character grow in such a way that they see the world through different eyes? Partly yes, and partly no. My first stab at putting into words the difference between growth and change came with my article, Character Arc is Not All About Change. Looking back it’s clear that my original post was a bit light and maybe a tad belligerent in its execution.1 The reason why I’m taking another crack at it here is because that difference between the two clouded my judgment during a recent analysis. You can have growth without change. An arc, as understood and accepted by most in the industry, represents a significant change to a character’s way of being. Compare the way they are at the end of the film to the way they are at the beginning—if they’re a different person then they have “arc-ed”. If they aren’t, then you’ve got a problem with your story. This is where conventional understanding of a character arcing falls short. Powerful stories exist with characters who don’t follow this model of growth. My understanding of story now is that you can split this concept of “arc-ing” into two separate items: Resolve and Growth. The idea being that you can have growth in a character while at the same time they maintain their resolve. Characters like this dig their heels in and bolster their courage in order to “stick to their guns.” There is no significant perspective change in this kind of character, but there is movement. In this way, you can have growth without significant change. Conversely you can have so much growth in a character that they ultimately throw away their cherished beliefs and resolve to see the world in a different light. This would be the commonly accepted use of the term “arc”. Deciphering between these two is not always as cut and dried as the above explanation. Especially if you come into contact with a wonderfully rich story. When referring to characters arcing, it’s important to realize that we are really only talking about the two principal characters in a story. These should be the only two who experience significant emotional growth. The rest of the characters in the story need to remain static emotionally as they provide the logistical backdrop for these two to develop against. If other characters grow significantly, it’s safe to say that there is probably more than one story going on. Unfortunately, multiple stories in a single piece, especially within the confines of a 2-hour film, often result in incomplete and meaningless stories. Thankfully this wasn’t a problem in Surf’s Up. Without a doubt, the easiest part of this story to identify was the Main Character. If there is any character we are to empathize most with, the character through which we experience the story’s events, it would have to be Cody Maverick. From the very beginning we get a sense of what it is like to be in Cody’s world. Here we have the classic penguin-out-of-water story: a penguin with aspirations of surfing finds himself stuck in the doldrums of a cold and bitter Antarctica. 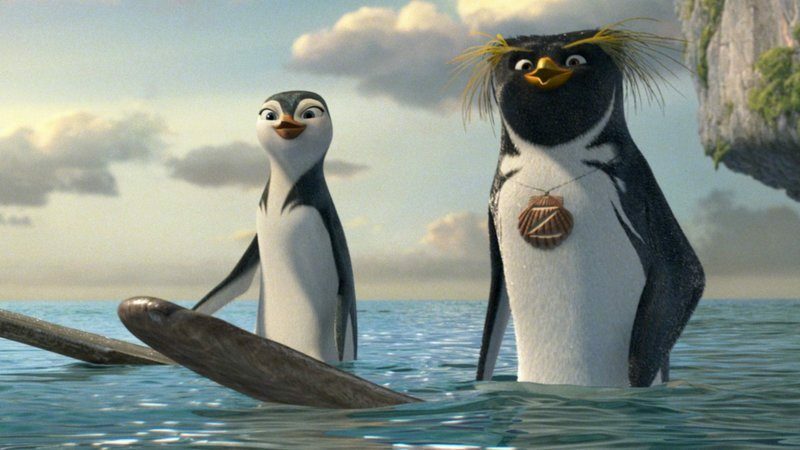 Voiced with charming sincerity by Shia LeBeouf, Cody rebuffs the scorn of his older brother and other penguins as he dreams of surfing in a championship like his hero, Big Z. The other principal character in the story, the one with which Cody will share a deep and meaningful relationship with, is also easy to identify. Although there are moments when his role as that special character is handed off to Lani (the “love interest” voiced by Zooey Deschanel), Big Z (Jeff Bridges) represents the character who has an alternate way of seeing things to Cody. The function of this character is to impact and influence the Main Character to grow in such a way that their personal viewpoint is challenged. Big Z fits that role perfectly. But just exactly what kind of growth occurs is the most interesting part. In any complete story one of the principal characters will undergo a significant change in the way they see the world, the other won’t. This is not to say that the one that remains true to themselves won’t undergo some degree of growth. Characters, like the people they’re often based on, must grow if there is to be any honesty in their portrayal. Stagnancy is death. But growth in a character is seen here separately from a complete change of heart. As defined earlier, one can grow in their resolve to stay devoted to the way they see the world. So it was with this knowledge that I confidently approached my initial analysis of Surf’s Up. At first, it was clear to me who changed and who remained steadfast. At the beginning of the film Cody is so excited about surfing that he tends to over-control everything. Cody was the kind of surfer who would force his way over any wave. He meets Big Z and as their relationship develops, Cody learns to stop trying to master every wave that comes his way. His climactic moment occurs during that wonderful point-of-view shot during the final race. Ignoring the voices of disapproval in his head, Cody focuses on simply riding the wave—just like Big Z taught him. Consequently, he rides the wave out to great applause. By learning to subvert his controlling tendencies, Cody overcomes his own personal problems. Pretty cut and dried—Cody was the one who changed. Sounds right, doesn’t it? Not exactly. Not if you look deeper into what is really happening. As that climactic wave builds in force and Cody begins to breathe harder and harder, voices from his past start voicing their disapproval, threatening to dissuade his resolve. And therein lies the key to what is really happening internally to Cody, and additionally the source of my initial error in analysis. Those voices were challenging his resolve—his initial drive to surf like a champion. Had he given up then yes, he would’ve been a change character. But he didn’t. Instead, he had learned a new technique to better hold on to that resolve. His perspective, his unique point-of-view that winners always “find a way” remained the same. Contrast this with another famous Main Character who learned to “let go.” When Luke Skywalker turned off his targeting computer in the original Star Wars, he was seeing the world in a completely different light. From the very beginning, Luke was always testing himself and his abilities against others—Biggs (in the original screenplay), the Sandpeople (“Let’s check it out”), and even Han (“I’m not such a bad pilot myself”). It’s only when he finally lets go and trusts in something outside of himself that he ultimately finds the outcome he had always been searching for. But unlike the stories of Luke and others with Main Characters who have undergone the same sort of “letting go” process, Surf’s Up still had more story to tell.4 That key moment with Cody on the surfboard was not the penultimate emotional moment that every story works towards. If you watch the film, note how different that scene is when compared to the one with Luke in the trench. The latter is rich with resolution, the former still feels like there is more left to say. I sensed this when I was first watching the film, but figured I was just out-of-practice when it came to analysis. Turns out I was, just not in the way that I had thought! Big Z starts out the story alone—a recluse who would much rather live in isolation than live as a loser. Faced with an apparent loss to Tank, Big Z went against everything he stood for, and quit. Faking his own death, he determined, was the only acceptable option when confronted with the ultimate shame of being called a loser. But then Cody comes into his life. And through this relationship with that young idealist, Big Z discovers that there can be salvation in losing. During the climax of the story, Cody throws the race in order to help out his friend, Chicken Joe (Jon Heder). The moment Cody has worked so hard and so long for is quickly tossed aside for something he believes even more strongly in: standing up for his friends. Cody sets the example of a true winner by losing—a meaningful gesture that unfortunately results in him surfing into deadly rock-filled waters. Big Z has no other choice than to risk exposure. Going against everything he stood for at the beginning of the story, Z heads out to save Cody from certain death. He has no idea how he’ll be received by the other penguins, but at that point he doesn’t care. This is a significant emotional change in Big Z’s internal nature and represents a huge fundamental paradigm shift in the way he approaches the world. It’s no longer about winning or losing for Z, it’s how he plays the game. It’s the kind of emotional change that I had anticipated when Cody took that big wave, the kind that makes a story feel complete and meaningful. While Cody certainly grew emotionally, it was Big Z’s growth into change that was at the heart of this story. Cody brought Z out of his shell and forced him to confront the lifestyle he had chosen for himself. No matter what obstacles were thrown Cody’s way he always kept steadfastly true to those words he had heard when he was a little kid, “A winner always finds a way.” Words that Z once believed himself, but had forgotten in an effort to hide from certain shame. Cody takes every opportunity, whether consciously or not, to remind Z of his own inspirational words. Eventually he was transformed by them. Every great story shares this dynamic: Two characters come into contact and influence each other in such a way that one’s worldview is significantly changed. Why don’t both change? Because you measure the change in one by the steadfastness of the second. If both change then audience members will have no reference point from which to meaningfully measure that amount of change. It’s like trying to measure the distance between two moving cars with a rubber band—you have to keep one constant for the measurment to be meaningful! There is a difference between growth and growth into change. By all means you want your principal characters to grow, to “arc,” but you also want to clarify precisely what kind of growth is occurring. Take your two principal characters and compare the way they are at the end of the story with the way they were at the beginning. One will seem to behave completely different. Their former self will seem almost alien to them, as they now see the world through different eyes. The other will behave the same whether we find them at the beginning, middle or end. The subtle difference is that now, at the end, their behavior will be a more informed one. They will have learned something, perhaps better coping skills or new techniques, but ultimately they will be going about things the same way. This is what it means to grow into one’s resolve; to grow but to remain dedicated to one’s worldview. Cody grows. Big Z grows into change. And it is Big Z’s throughline that gives this story the fundamental paradigm shift it requires to be meaningful. While Cody grew internally, he remained steadfast in his belief that a winner always finds a way. And in doing so, he helped Big Z find his.